I’m not a germaphobe, never have been, never will be, but you will NEVER see me drinking from a water fountain. ( I would have to be very desperate) Even before I read the multiple studies that show that water fountains have more bacteria than toilet seats and supermarket floors, I shied away from them. Why? The proof is in the pictures! I have witnessed pretty much all of these and more. 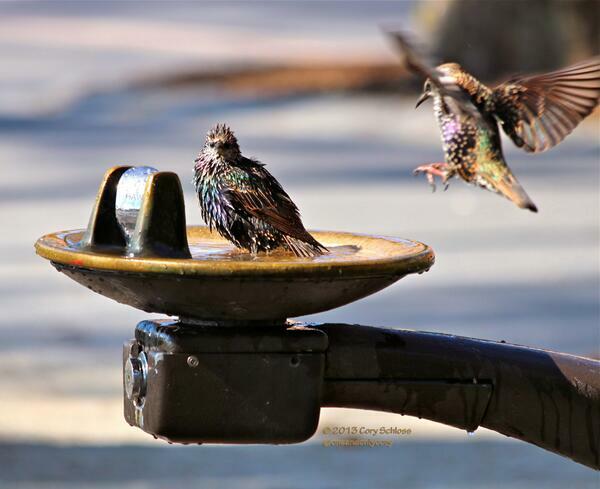 Bird Bath This photo taken by a friend @Oneandonlycory is beautiful. The birds are enjoying a nice bath in a central park water fountain. If I were sitting in the park I would be entertained and could watch the birds play for hours. Be sure to follow Cory on twitter @Oneandonlycory for more beautiful shots of NYC. Squirrels: These little furry creatures also enjoy the occasional drink from the same fountains that you may frequent. Just think of where those little feet and bushy tail have been. Yuck! Dogs – Man’s Best Friend I am a dog lover, of all shapes, sizes and breeds. I get that sometimes it is hot and they need water, but please fill a bowl/cup or “make” a cup from your hands. The positive? At least they are not licking the spout! Trash Can: Why people think that a water fountain is a good alternative to a trash can I will never understand. I have seen all sorts of garbage placed in them. I will spare you the details of what I have seen – but you can imagine. Gum: Yes I am sure you remember the “prank” where you stick the gum on the spout so that the next person gets splattered in the face with the water – and sometimes gum. Not funny and just gross. 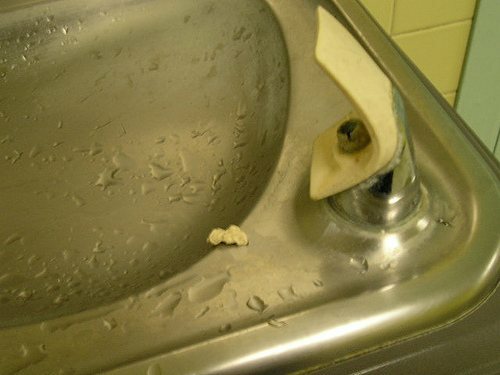 Just plain Dirty: There is no trash in this water fountain, but it is obviously not cleaned very well. I have seen plenty of these in schools. You wouldn’t drink from a dirty class would you? Hand washing: Seriously? Yes this happens! I have seen this a few times. People actually wash their hands in the water fountain and then unsuspecting people come by next and drink from it. A 1993 study published in Pediatrics found traces of rotavirus (a leading cause of diarrhea) in the fountains at daycare centers. A 2005 study by the National Sanitation Foundation (NSF) found 2.7 million bacterial cells per square inch, which was thousands higher than any other area in the school they tested including the toilet which came in eighth in their list. In another study by the NSF in conjunction with Real Simple magazine in 2008 they tested the bacteria levels of different surfaces with which the public comes into contact with such as door handles, water fountains, supermarket floors and park sandboxes. Guess what came up as the germiest? 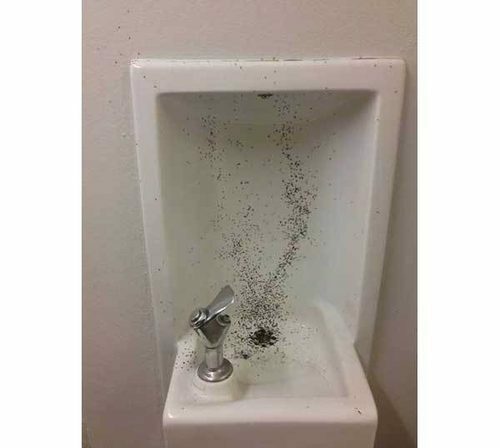 Yes.. the water fountain with 62,000 colony-forming units (CFUs) of bacteria per square inch! The sandbox at a park had only 7,440 CFUs! Still Want to Drink From One? If you MUST: let the water run for a few seconds before drinking, and try to wash your hands before and after touching any fountains. NOT IN THEM!! Very convincing!!! The pictures have shown me just what you mean. Appreciate the advice. I’m completely scared now. Sheep? Yikes, that can’t be good at all! I think my children will enjoy seeing this (and a good reminder too). You completely convinced me! 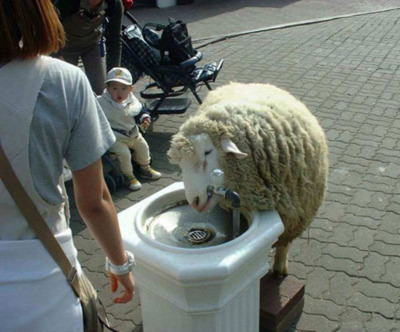 I wasn’t that crazy about it in the first place, but I will always see that sheep whenever I see a drinking fountain now! :) Great post! LOL.. Thanks! 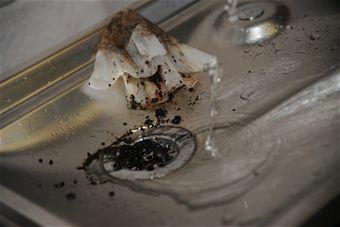 It is a good thing that I did not post some of the other nasty things found in or on water fountains!